Small businesses and start-ups face many unique challenges, especially when it comes to developing and manufacturing products. 3D printing can help businesses make the most of their development cycles by providing inexpensive rapid iteration of parts and prototypes. Once the product design is complete, 3D printing is a very cost effective option for small- to medium-sized production runs. RapidMade used the Multi Jet Fusion 3D printer to help Hoyt St Electric Skateboards quickly develop and validate parts, saving them tens of thousands of dollars and months of development time. When they were ready start manufacturing final products, RapidMade was able to seamlessly scale up production into full-size runs. 3D printing’s ability to personalize treatment has accelerated its adoption in the medical field, where professionals are using anatomically correct educational models to improve student training and surgical outcomes, as well as printing custom surgical guides, limb prosthetics and body implants. Additionally, doctors are converting patient-specific scans to 3D printed models to better explain medical issues, upcoming surgeries and treatment options. Sometimes 3D printing can only go so far when developing and manufacturing products in their early stages. In those instances, rapid injection molding can help take a new product to the finish line. RapidMade used rapid injection molding to help an LED light bulb manufacturer quickly iterate through prototypes without the tooling costs or lead times associated with traditional injection molding. Once their designs were ready, it was easy to transition into production. Clients come to RapidMade at different stages in their projects: some of them have a complete design ready to be made, but many just have an idea of what they want. We introduce our industrial design services to help all of our customers make their visions into reality. Learn about how RapidMade is growing our internal capabilities for our customers by adding industrial design and other engineering services to our roster. Collaborative robotics is an exciting field which designs robots to work in collaboration with skilled workers. Whether assisting a surgeon in the operating room or a technician on an assembly line, collaborative robots, or cobots, can improve efficiency in a wide range of industries with minimal reconfiguration of existing production flows. In order to perform their tasks, cobots need tools and parts organized in precise locations. RapidMade is able to quickly design and manufacture custom thermoformed trays for use with cobots. 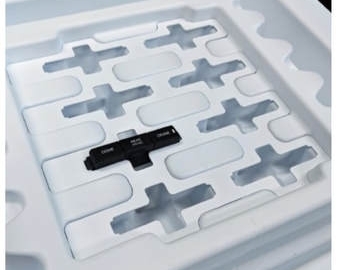 Moreover, because of our rapid tooling services, custom trays are cost effective for low- and high-volume orders alike. This case study was originally written by one of our sales representatives, Jenny Hopewell, of Hopewell Companies, LLC. Sometimes a client has an existing product that they want adapted for a different size or a hard-to-find part that they want replaced. With our reverse engineering services, we are able to easily recreate and adapt existing products for our clients. One of our clients came to us with retro phone case design for a Samsung smartphone. The only problem: the original product was made for an iPhone. RapidMade was able to reverse engineer the design and even added a hinge to accommodate the openable back panel of the Samsung phone. A client approached RapidMade for help solving a fundamental problem with a first-of-its-kind digital printing line. They were trying to use a new, UV-cured ink on corrugated cardboard, but the cardboard was absorbing the ink before it could cure. RapidMade was asked to design and help manufacture a machine that would apply a coating to the surface of the corrugated cardboard without allowing it to be absorbed. You can read more about how RapidMade was able to create this unique machinery by clicking the button below. Captain Derrick Ray of the Discovery Channel's hit show, The Deadliest Catch, is a captain for one of Alaska's most successful and beloved crab fishing tours, Bering Sea Crab Fisherman's Tour. Every summer, Ray takes customers out on the high seas to simulate the experience of crabbing—without the rough weather, long hours and extreme danger. Seeing crabs up close is the highlight of the tour, but keeping crabs around to pull out of the water was too expensive and bad for the crabs. Ray and his company wanted a more sustainable approach, so they contacted RapidMade to help them cast rubber crabs that could be reused season after season, lowering costs and saving real crabs.